In Overwatch, certain people pick Symmetra for the sole purpose of placing teleporters near ledges and watching gung-ho allies with stars in their eyes and dreams in their hearts plunge to their deaths. The first time it happened to me, I laughed. These days, though, the joke’s old. In this clip, Will-e M nearly falls for the old Symmetra teleporter trick, but he catches on at the last possible second. Then he turns and sees Symmetra facing away, using her sitting emote to give everybody one final, infuriating glimpse of the troll who did them in. Dilemma: she’s an ally, so he can’t damage her. His solution? Get behind her hover-stool and push. 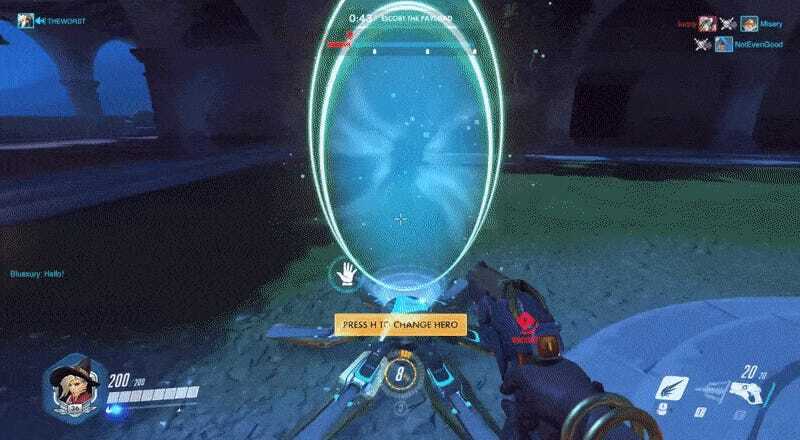 It works, and Symmetra falls to her death. How’s that for a taste of your own medicine? I don’t think Symmetra trolls are the most annoying thing in Overwatch, but damn, this is satisfying. Call this man Junkenstein, because he just got revenge for us all.